Published in: American Federation of Labor: History, Encyclopedia, Reference Book (Washington: American Federation of Labor, 1919); additional digital editing by Tim Davenport, no copyright claimed. Consumer activism has a long history in Canada. From the union label campaigns of the early North American labour movement, to the more contemporary “Buy Domestic” slogan of some unions, to the “buy local” movement popularized by environmentalists, the link between activism and consumption has long been recognized. I would like to suggest that this trajectory has not been entirely progressive, and that current consumer activists need to learn from the past. It’s not enough to just buy domestically, or locally: people involved in the production process need our attention, too. For example, it is laudable to call for local, sustainable agriculture, but we cannot ignore the exploitative working conditions that can also grow in our local communities. 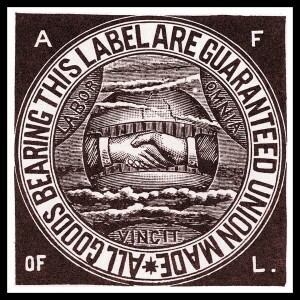 The North American union label movement, rooted in craft unionism, began in 1869 and spread quickly over the next decades. Products made or services offered by unionized workers were clearly marked with a union label; fellow working class consumers were in turn encouraged to purchase products or services with the union label. While this movement did not disappear entirely, its popularity did wane. The growth of the industrial unionism in the twentieth century partially contributed to this; many union members were involved in large scale mass production with a less clear personal connection to consumers. To cite an example given in a lecture I recently heard, steelworkers are unlikely to enjoy much success convincing working class woman to buy union-made pig iron when it is not them, but rather large manufacturers buying this product. This economic complexity continues today, and can still pose challenges for contemporary activists. But consumer activism has been embraced by some industrial unions. The slogan “Buy Domestic” is practically synonymous with the Canadian Auto Workers (CAW); however, nationalist buying campaigns originated in the United States with the International Ladies’ Garment Workers Union (ILGWU) and the United Automobile Workers (UAW). Dana Frank’s Buy American: The Untold Story of Economic Nationalism explores some of the major problems surrounding ‘buy American’ rhetoric, and its support of “corporate patriotism” and even outright racism, wherein American corporations and workers were pitted against “foreign” people and products. Of course, nationalism in Canada has a much more complex relationship with left-wing politics. As Steven High illustrates in Industrial Sunset: The Making of North America’s Rust Belt, 1969-1984, an appeal to nationalism often buttressed unionized workers in Canada from some of the harsher realities of North American deindustrialization. However, I would like to suggest that a Canadian “Buy Domestic” campaign is still fundamentally flawed. First, it is silent on the importance of buying union-made products. Is someone driving a Honda, made in Canada by a non-unionized workforce, realizing the CAW’s message? Presumably not. Furthermore, buying domestic presupposes just working conditions for all within the nation. This suggests that sweatshops do not exist in Canada, when, in fact, they do. It overlooks the many forms of precarious labour that thrive in a country that has embraced neoliberalism, and working people who have been historically excluded from protective labour legislation in Canada, such as domestic service workers and farm labourers. Buying domestic is no guarantee of fair labour practices. The “buy local” movement emerged from “green politics,” wherein people are urged to “think globally, act locally” by considering the health of the entire planet while taking action in their communities. Proponents of buying locally point to the environmental and social costs of shipping products such as food across the world, pointing to the added benefits of better working conditions (in ‘developed’ countries). But what about the import and export of people whose labour prepares local food for local markets? Canada provides fertile ground for exploitative working conditions through the Canadian Seasonal Agricultural Workers Program. Persistent and sustained unionization efforts have largely been unsuccessful. Workers caught supporting unionization can be fired and “repatriated.” Critics of this program point to workers’ exclusion from Health and Safety Legislation, most of the Employment Standards Act, 12-15 hour workdays without breaks or overtime, low wages and substandard housing – all which can and has flourished in our local communities. Buying locally, then, is certainly no guarantee of socially conscientious consumerism. Buying domestic or buying local is not enough. Without insisting on the union label, consumer activism is limited to half measures, leaving unchallenged the spaces for exploitative working conditions in so-called developed countries.